It’s Christmas vacation and you’ve got better things to do than sit around reading snarky college football picks, but jussssttttt in case you’re still in the office this week we’re running through all of the December 23-29 bowl games in this week’s Wager Wednesday. We’ll be back next week with our picks for the remaining games and the College Football Playoff. Merry Christmas ya filthy animals. BOISE STATE (-8) vs. NORTHERN ILLINOIS: The Broncos and Huskies meet in a battle of mid-majors that miss the BCS…give us the Broncs for old time’s sake. The Pick: Boise State. GEORGIA SOUTHERN (+7.5) vs. BOWLING GREEN: The Georgia Southern offense is worth clicking over to ESPN, but they can’t keep up with the Falcons. The Pick: BGSU. MTSU (+4.5) vs. WESTERN MICHIGAN: I don’t know if the Bahamas Bowl has the same appeal now that winter doesn’t exist anymore, but I’ll go with #MACtion. The Pick: Western Michigan. SAN DIEGO STATE (-1.5) vs. CINCINNATI: The Bearcats won’t have a quarterback in Honolulu…just like both Pro Bowl teams. The Pick: SDSU. UCONN (+5) vs. MARSHALL: I prayed for this match-up every year that I lived in St. Pete and had friends coaching at UConn. Now that neither is true my prayers have been answered. Alanis Morissette should write a song about me. The Pick: UConn. MIAMI (+2.5) vs. WASHINGTON STATE: Marquee programs tend to crap the bed in the Sun Bowl (see: USC), but I can’t bring myself to pick Wazzu over the Canes. The Pick: Miami. WASHINGTON (-8.5) vs. SOUTHERN MISS: I don’t know what Zaxby’s is, but every time I see the name I picture the department store from A Christmas Story. Ho, Ho, Hooooo: The Pick: U-Dub. INDIANA (-2.5) vs. DUKE: We’ve been over this: Miami killed Duke. The Pick: Indiana. TULSA (+14) vs. VIRGINIA TECH: Does it bother anyone else that the Independence Bowl isn’t in Philly anymore? No? Ok, nevermind. Bon voyage, Frank. The Pick: Virginia Tech. UCLA (-6.5) vs. NEBRASKA: I don’t care how many points they’re getting…I’m not picking a 5-7 team in a bowl game. The Pick: UCLA. PITT (+3) vs. NAVY: I hope the Pitt players aren’t as fired up by this destination as their fans are. The Pick: Navy. CENTRAL MICHIGAN (+6) vs. MINNESOTA: Oh look, it’s every regular season, Doris Burke, noon start game in ESPN history! The Pick: Minnesota. CAL (-7) vs. AIR FORCE: Air Force has lost more Armed Forces Bowl than any other program, so there’s no sense messing with tradition. The Pick: Cal. NORTH CAROLINA (-1) VS. BAYLOR: Baylor is the biggest disappointment of the 2015 season. When they’re healthy I truly believe they’re the best team in the country, which makes it all the more upsetting that they’re probably starting a kicker at QB this week. The Pick: North Carolina. 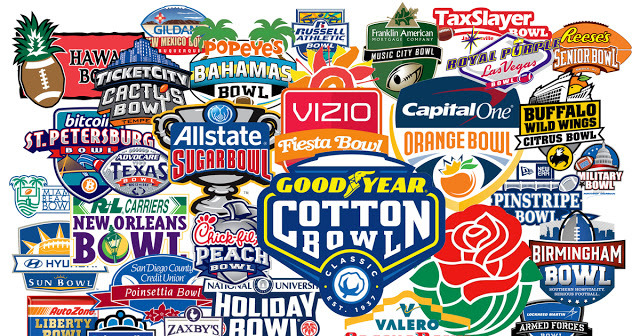 NEVADA (+3) vs. COLORADO STATE: There are too many bowl games. The Pick: Colorado St.
LSU (-7) vs. TEXAS TECH: If the Texas Tech offensive line can hold up for four to five seconds per play this is going to be insanely entertaining, so why not take the points? The Pick: Texas Tech.